In 2016 she was looking forward to early retirement and had a list of holidays with husband Phil already arranged. “We had four booked. We were going to Dubrovnik, Skiathos, the Lake District and I was going to the Italian lakes with my daughter,” says Sue, 60. “But all of those plans were bashed. Just as we were looking forward to everything, life pulled the rug from under our feet. “I started having symptoms but they were very subtle. Looking back now they were the tell-tale signs but because I didn’t know much about ovarian cancer, I didn’t put two and two together. “Yes, I wanted to wee a bit more often than normal but I just put that down to my age, and at Christmas time I was eating my dinner and it just felt like it wasn’t going down. “I thought to myself, ‘I’m slouching when I’m eating, I must sit up straight because my dinner’s not going down properly’. “I was getting a bit bilious, a bit burpy, and I said to my husband, ‘Something’s upsetting me’, and finally, I sleep on my front but it was becoming really uncomfortable. “I was feeling tired as well but because I’d just given up work I thought I was just being lazy and it was all catching up with me. “So I ticked all the standard symptom boxes but the trouble was I – like most women – just didn’t know what the standard symptoms are. “I’ve never had any pain, to this day, but one morning for some unknown reason I was lying in bed and I prodded my stomach, and on the left side I felt a lump. “It was quite hard but I didn’t think much of it, and a couple of days later I said to my husband, ‘Have you got this lump?’ and I pushed his stomach and it was all squishy and I thought ‘Hmm’. “But I went to the GP about something unrelated and they sent me for blood tests. I went back for the results and got a clean bill of health, my cholesterol had never been so low, and it was literally as I was walking out the surgery that I said, ‘By the way, I think I felt something in my abdomen. I think I’m wasting your time but could you have a look?’ and I could see her face change. “I was sent for an urgent ultrasound and the mass was 15 by seven centimetres, so quite large. And it was Grade 3C – Grade 4 and I wouldn’t be sitting here. “I was sent for more blood tests and this is where I want to bang the drum because they didn’t check my CA125 level the first time. “The benchmark for CA125 is anything above 35 rings the warning bells. Mine was 6,500 – and two weeks later it was 8,250. 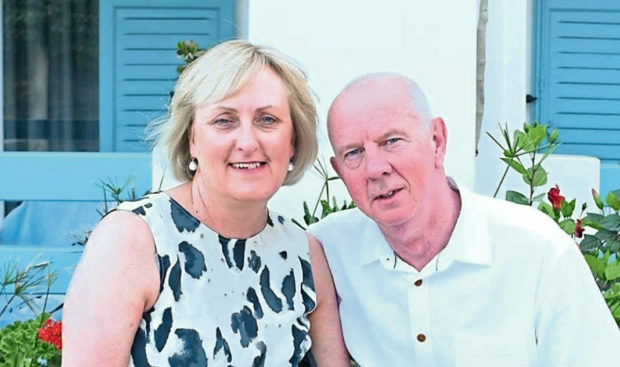 Despite the fact one in 50 women will develop ovarian cancer and 11 ladies a day die of the disease, like many Sue found it difficult to access information and advice until an online search found Target Ovarian Cancer. “I Googled it and found Target and they were phenomenal. One of their specialist nurse advisers phoned me back and she went through everything with me. “She told me it’d probably be three chemos, then surgery – and I thought it would be keyhole, not realising how massive the operation was – then three more chemos, and she was bang-on. “She said, ‘17 days after the first chemo, your hair will fall out’ and again she was spot-on. “I coped well with the treatment but losing my hair was awful, the worst bit of it all. I loved my dad, he was on a pedestal, but every time I looked in the mirror I looked like him and I didn’t want that! “When my hair was falling out I said to my husband, ‘you’ve got to shave this’ and we sat on the bedroom floor, he shaved it all off and we sobbed our hearts out. “He hated doing it, and I hated having it done but it grows back. “I say to other ladies it’s like trees in spring, once it starts coming back it comes back quickly. “I was very lucky, I was one of only four ladies in Guy’s Hospital to be offered an immunotherapy trial, and I was on it for 13 months. “I’m now in remission. I’m on three-monthly visits with blood tests. “On the trial I was having three-monthly CT scans so I knew I was OK but I won’t have any more scans unless my CA125 level’s increasing – just now it’s 13. “They’ve not done all this for me to sit and feel sorry for myself, they’ve done it so I can get out and about and enjoy my life so we’re working our way through that holiday list. “We’re going to Skiathos and we’ve had a couple of cruises. Call Target Ovarian Cancer’s nurse-led support line is open Monday-Friday 9am-5.30pm. Call 020 7923 5475 or visit www.targetovariancancer.org.uk/supportline to email them or ask for a call back.